Have Plans for Valentine’s Day in Medford? Rogue Regency Can Help. Do you have plans for Valentine’s Day? Here at the Rogue Regency, we want to make it easy for you! Food, entertainment, and a guest suite for two – we’ll handle all of the details so you can focus on what’s important – enjoying your Valentine. Celebrate a special night with your special someone! To help you start planning your Medford, Oregon romantic escape, we’ve created some wonderful packages to make sure you and your valentine have a night to remember at your favorite Southern Oregon resort! Date Night Package – Dinner for two, comedy tickets, and a guest suite. What more could you need for a perfect romantic getaway? Grab your sweetheart and head over for the perfect date night! 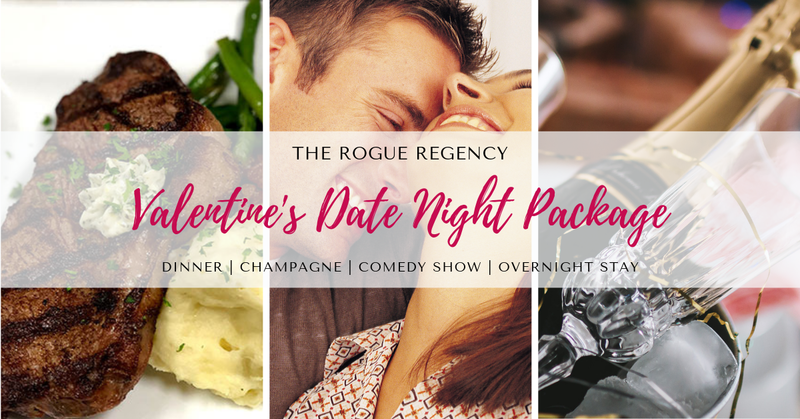 Ultimate Date Night/Valentine’s Day Package – All of the fun in our Date Night package, with a bottle of bubbly added in! Grab your valentine and let Rogue Regency provide the perfect romantic escape from the real world! We look forward to assisting you in planning your ideal Valentine’s Day escape! For more information, or to book your romantic getaway today, give us a call at 541.770.1234!